As I have mentioned several times lately, I just moved back to New Mexico from California. My rent and the majority of my expenses are a fraction of what they were prior to my move back here, but there is one expense that just went up — I needed a new vehicle. See, New Mexico is the land of dirt roads, arroyos, beaten paths, and trailblazing; it is not the land of nicely paved roads. Sure, the highways are fine, but around any town or city the roads are barely paved and often just rutted dirt paths. A MINI Cooper S, the car I had in California, doesn’t cut it here because it is so low to the ground that there are places in town that I couldn’t go to. Thus it had to go for that reason and one other, which is my plan to hit the road later this year with a camper being pulled behind my car. The MINI wouldn’t pull a camper too well, I am afraid. So what did I have to do to meet my requirements for where I currently live and where I plan on going? And not just any old truck but rather a brand new one, something I said I would never do again. 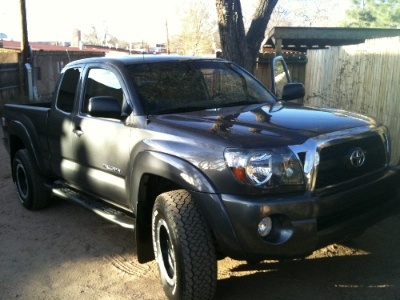 But last week I drove home a 2011 Toyota Tacoma V6 4X4 Access Cab pickup truck for $4,000 under sticker on the last day of the month and the quarter at the Toyota dealership. It was truly a great deal on the truck I ended up with. When I first started shopping for one I was looking at exclusively used 2 year old Tacomas, but they hold their value so well that they were literally only $1000 less than what I could get a brand new one for — if not exactly the same price. It made no sense whatsoever to buy used at that point. Instead, I wanted to talk about credit scores. My credit score is a solid 800 give or take a few points depending on which agency reports it. Some of you may remember that back in September I mentioned how having a high credit score enabled me to quickly land the house rental I wanted without too much fanfare. Well, the same thing happened when I went to finance the balance I would owe on the truck, as when the finance guy asked me if I knew what my credit score was and I said “around 800” he told me I wouldn’t have any problem at all getting the absolute best terms. I was curious if I would be able to do so, as being self-employed is sometimes a red flag for lenders because you don’t have a steady weekly or monthly paycheck to prove your income; rather you have to show your last tax return or two in order to maybe qualify for a loan. For example I know that a mortgage would be incredibly difficult for me to get right now! However for my car loan they glanced at my 2010 tax return and my credit score and instantly offered me a great rate. I couldn’t be happier with what I ended up with, as the rate was exactly the same as what my credit union is currently offering. But what if my income had been the same but my credit score was terrible? I could have ended up paying 18.9% interest on my car loan instead of the < 4% I am paying now. That’s right — for those customers with a credit score of less than 580 the interest rate is 18.9%! And sure enough, when I asked the finance guy if there were truly people buying cars and paying 18.9% interest, he responded with a resounding “Yep!”. He said most people fall somewhere between and end up paying around 7 or 8% here in New Mexico, but that plenty of customers pay ridiculous interest rates because their credit scores are absolutely terrible. This is how much influence your credit score can have on your purchasing power — the lower your score means the more you pay for the exact same product that I am paying less for because of my high credit score. So before you even think about making any big purchases, make sure you get your credit score up as high as you can. It makes absolutely no sense to pay such high interest rates on big-ticket purchases like cars if you can help it; and believe me, you can help it. Back in January I wrote an article titled How to Build Credit History – 9 Ways to Improve & Build Good Credit Fast which offers tips on building credit and improving your credit score. Months before you head out to the dealership or mortgage lender, do yourself a favor and start working on improving your credit. It could save you thousands and thousands of dollars! And for those of you wondering — Yes, I plan on paying off the truck balance within the next year. Good thing my expenses are so low to allow me to do so quite easily! Thank you Citi for my $100 gas rebate form. My favorite post for the month of December-how we paid off debt. Carnival of Personal Finance #77 is up at Money and Values! Favorite posts about money, insurance, customer service, debt and saving from 2006. David you are right when you say it’s important get get your credit report/score before applying for any loan. Most experts say to do this at least a few weeks before so you have time to clear up any errors. (Like your ex-wife still using an old joint department store charge account). The interest rates that are out there for those with lousy credit totally blow my mind! Like you, my husband and I hover between 790-815, depending on who you are talking to. Right now, we are paying off our final credit card balance (in our long road to being debt free..$72 K down, $12 K to go) at 2.99% interest for the life of the balance, with only a 3% tranfer fee as we took this from a 8.99% card. The latter is the highest rate we have anywhere. It is pretty easy to dig out when you are sending $900 a month and only eleven or twelve dollars of that goes to interest. Stark contrast to the days of Jimmy Carter, when our tiny $51K first home carried a 14.75% mortage, making our payments almost $900/month. Our current home was four times that cost and our payment is only three hundred dollars more! A person with a low credit score is considered a risk, so of course they get the gift of an extra incentive to make their payments in the form of higher interest. Having a good really can save you thousands. For younger people such as myself the best way to build credit is buy paying bills on time. Getting a credit card and only making one big purchase with it and paying off that big purchase. You are absolutely correct thanks for the information. Great post. Many people fail to realize the value of their credit score and not only how it can save them money, but it’s also an intricate part of everyday life now. Once your credit gets ruined it’s very difficult to get anything without having significant amounts of cash at your disposal.